When a soldier sustains a traumatic eye injury on the battlefield, any delay in treatment may lead to permanent vision loss. With medical facilities potentially far away and no existing tools to prevent deterioration, medics are in a high-stakes race against the clock. A multidisciplinary team of scientists and engineers at USC are close to solving the problem. 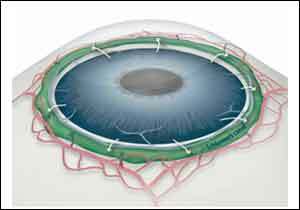 They have developed a reversible, temperature-sensitive temporary seal that changes from a fluid to a super-strong semi-solid when applied to the eye. When the patient is ready for surgery to permanently close the injury, doctors can remove the seal by adding cool water. Results of the study were published on Dec. 6 in Science Translational Medicine. The study represents the latest development from the USC Institute for Biomedical Therapeutics, which fosters collaborations between scientists at the Keck School of Medicine of USC, chemists at the USC Dornsife College of Letters, Arts and Sciences and engineers at the USC Viterbi School of Engineering. USC has made research in convergent bioscience and biotechnology a priority to address health issues across the lifespan through the development of new diagnostic tools, treatments and biomedical devices. The material the group was working with for retinal implants was a hydrogel called PNIPAM, poly(N-isopropylacrylamide), which had a unique attribute that made it a natural fit for this application: When cooled, the hydrogel became a liquid for easy application, and when heated, it became a viscous semi-solid with strong adhesion. All that was needed was some tailoring. When an ophthalmologist is ready to repair the eye, the hydrogel can be extracted by applying cool water and converting it back to a less adhesive state. The research team also developed a special syringe for the hydrogel that would be easy to use on the front lines and capable of quickly cooling the hydrogel before application. The syringe has a cooling chamber filled with calcium ammonium nitrate crystals — the type that is used in instant ice cold packs. By adding water to the chamber, the crystals activate and cool the hydrogel to operating temperatures within 30 seconds. The customized seal and delivery device will also reduce the amount of time it takes to close penetrating eye injuries overall. “This temporary intervention could decrease repair time from 30 minutes or longer to less than five minutes, freeing up valuable time for first responders and trauma units,” says principal investigator Mark Humayun, university professor of ophthalmology and co-director of the USC Roski Eye Institute and director of the USC Institute for Biomedical Therapeutics. To establish the material’s efficacy, a rabbit model was used. Results showed that when applied to eyes with penetrating injuries, the hydrogel improved pressure within the eye, which may be critical for preventing retinal detachment that can ultimately lead to vision loss. There also was no evidence of inflammation or infection for up to four weeks of use. The researchers hope to initiate clinical safety testing in humans in 2019. Whalen envisions applications for the hydrogel that go beyond the battlefield.